If your system is running slowly, perhaps a process is using too much CPU time and won't let other processes run smoothly. 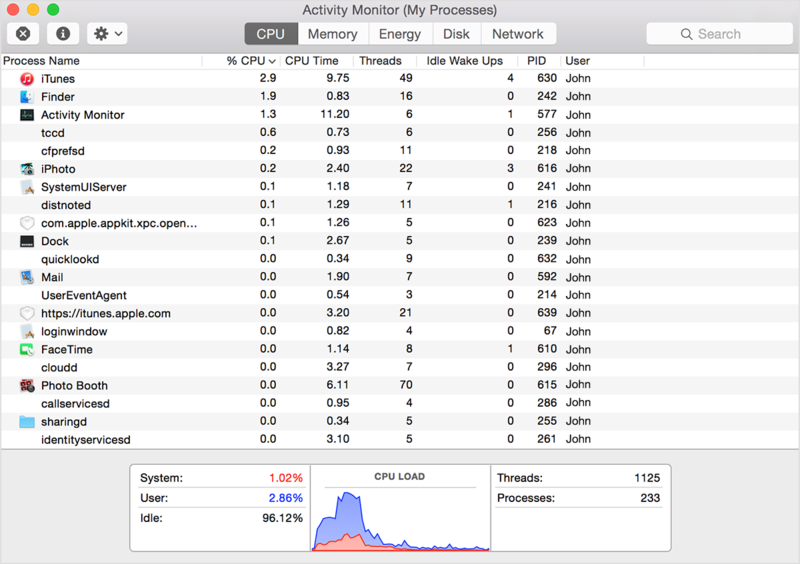 To find out which processes are taking up a lot of CPU time, you can use Apple's Activity Monitor. Click the top of the “% CPU” column to sort by the percentage of CPU capability used by each process. If one of the top processes displays a large number (80-100% or more!) then this process may be hogging the CPU and preventing the other processes from doing their tasks. This can result in slow response times, beachballing and even some applications freezing. A process with a high "% CPU" value is worth profiling. A process that often freezes or beachballs, even though all other applications run smoothly and "% CPU" is very low, is also worth profiling. Profiling is much better with the Xcode tools installed. Instruments has a command-line interface to provide detailed profiling that can be opened in the Instruments application for investigation. If Xcode Command-Line Tools are installed, it is best to use Instruments to profile your application. If Xcode Command-Line Tools are not installed and you would rather not install them, skip to the next section for profiling with sample. In this example, we will show how to profile ecore. The first entry is the currently running instance of ecore. (We'll ignore the second entry as it is only an artifact of the actual search). The second column is our PID., in this case 5773. After 30s (30'000ms), instruments will save the profile to the Desktop and exit with a message indicating the name of the latest profile file. This file can be opened in Instruments or forwarded to a developer to understand what performance issues have arisen in ecore on your computer. This will sample process 5773 for 30s and write the profile to the given path. This file can be opened as text or forwarded to a developer to understand what performance issues have arisen in ecore on your computer. Under the hood, sampling checks your process every 1 ms and reports what your process was doing at the time. The data might not always be pertinent. This will set the scheduling priority of your process to the maximum. If you are using profiling to diagnose a specific operation in your process like drawing a view or listing files, you need to make sure the specific code is triggered as often as possible (by refreshing the view a lot, or performing a lot of ls) during the sampling period. If none of these options yield better results, or do not apply to your case, it is always possible to extend the sampling duration. 30 seconds seems a bare minimum and you will always get more data if you sample longer. In order to understand a problem on Mac, it is sometimes useful to get a full system diagnostics. Apple provides an interface to generate extensive diagnostics about many system services and features. To generate a full system diagnosis, follow these instructions. Choose the file with name similar to sysdiagnose_2015.11.18_14-36-34+0100.tar.gz and send it to customer care. Type the name of the app/executable in the search field in the upper-right corner. In this example, we type ecore in the search field. [French] non-tech (sample) version : profiler une application.
) récurrentes voire des applications qui bloquent. Il est intéressant de profiler un processus qui a une grande valeur de "% CPU". La première réponse est l'exécution en cours de ecore, et la deuxième colonne de cette entrée est votre PID, ici "5773". Ouvrez un terminal et tapez en remplaçant "5773" par votre PID. Cela va échantilloner le processus 5773 pendant 30 secondes et écrire le profil du chemin d'accès vers le fichier souhaiter. Ce fichier peut petre ouvert comme texte si vous le souhaitez, mais surtout : pouvez-vous nous le transférer en pièce jointe à ce mail s'il vous plaît ?